The IntelliVue family of networked patient monitors gives care teams throughout the hospital more of the information they need right at the patient side presented in clear and meaningful ways. All share a common user interface and outstanding industrial design. The IntelliVue patient monitors portfolio spans care environments, patient acuity levels, and clinical requirements. Multi-Measurement Module enables data continuity among monitors throughout the patient stay. 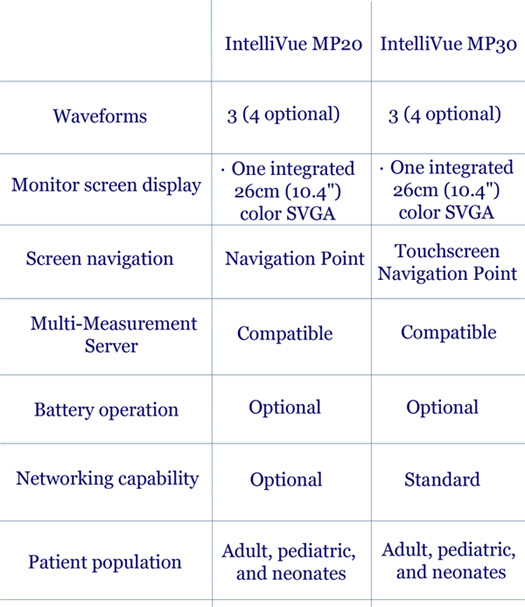 IntelliVue MP20 and MP30 patient monitors provide powerful monitoring capability and essential measurements in a compact package to match the pace and unique needs of intermediate care, ambulatory surgery, post-operative care, special procedures, lower acuity environments, and patient transfer. Built on Philips strong heritage in patient monitoring, the IntelliVue MP20 and MP30 has highly flexible screen configurations designed to suit patient acuity, department protocols, or specific procedure requirements. IntelliVue MP20 and MP30 monitors are easy to use and operate on a networked platform that can span the hospital enterprise. They can operate via wireless or wired connections. Through Philips inventive Multi-Measurement Module and extensions, the MP20 and MP30 deliver best-in-class clinical measurements including capnography, conventional diagnostic 12-lead ECG, noninvasive and invasive blood pressure, respiration, FAST-SpO2, temperature, BIS, and cardiac output. * 26cm (10.4˝) color SVGA display with 3 or 4 waveforms is bright and easy to read. * Comfortable handle and rugged housing for easy portability. * Lightweight, at only 5.8 kg (13 lbs.) including Multi-Measurement Module and one battery. * Up to five hours battery operation* with dual lithium-ion batteries. * Wired and wireless connectivity with easy switching from one mode to another. * Navigation Point operation designed for easy information input and onscreen navigation. * Optional integrated recorder offers convenient documentation whenever it's needed. * 5-hour battery time based on these conditions: basic monitoring, 2 new batteries, automatic brightness reduction, Multi-Measurement Server in use, NIBP measurements every 15 minutes. 4-hour battery time based on these conditions: extended monitoring, 2 new batteries, automatic brightness reduction, Multi-Measurement Server and Server Extension in use, NIBP measurements every 15 minutes, and recording every 15 minutes.